John Coltrane -tenor & soprano sax (tracks 1 to 5) Don Cherry -trumpet & pocket trumpet (all tracks) Charlie Haden -bass (tracks 1,3,6 & 9) Percy Heath- bass (tracks 2,4 & 5) Eddie Blackwell – drums (tracks 1 to 5) Billy Higgins -drums (tracks 6,7,8 & 9) Ornette Coleman – alto sax (tracks 6,7,8 &9) Walter Norris -piano (tracks 7&8) Paul Bley -piano (track 9) Tracks 1 to 5 recorded NYC June 28th and July 8th 1960. Track 6 recorded Hollywood May 22nd 1959, Tracks 7 and 8 recorded L.A. February 22nd 1958. Track 9 recorded live at the Hillcrest Club, L.A. October 1958. This session was Coltrane’s third recording for Atlantic records coming between `Coltrane Jazz` of 1956 and the three fertile days in October 1960 which produced `Coltrane Plays the Blues`, `Coltrane Sound` and `My Favourite Things`. 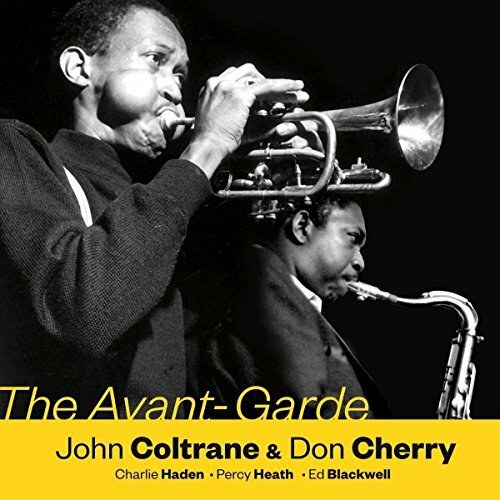 It is a collaborative effort with Don Cherry, who shares equal billing, in which Coltrane metaphorically puts on Ornette Coleman’s clothing and finds they don’t fit too well. Working with the better part of Ornette’s band, Coltrane performs four pieces from its repertoire and an original penned by Cherry in the `harmolodic` house style. These tracks comprise the original release and this re-issue adds a further four versions of the Ornette Coleman compositions taken from `The Shape of Jazz to Come`, `Something Else !! !` and `Live at the Hillcrest Club` which are presumably included to enable the listener to compare and contrast but only serve to highlight the superiority of the originals. It isn’t that anyone plays badly, far from it; it’s just that Coltrane sounds uncomfortable, his rather bleak tone thrown into sharp relief by the absence of the swirling piano and polyrhythmic drumming of his `classic` quartet sides. Coleman, on the other hand, was never comfortable with a piano, as the two tracks taken from `Something Else!! !` demonstrate. Hands placed on a keyboard seemed to tie him down as he tried to soar free of conventional harmonic restraint. Curiously enough he sounds more comfortable in the company of Paul Bley on the `Hillcrest` side, whose wide open intervals worked so well for Jimmy Giuffre in his `Fusion` and Thesis` recordings. Sadly, the live recording at the Hillcrest Club doesn’t pick up the piano very well though it is worth having to hear Ornette at a formative stage in his career and if you can find a copy of the full session which came out on Gambit back in 2007 you should grab it. Returning to `The Avant Garde`, it’s worth noting that it features Coltrane’s first recorded performance on soprano sax – he performs a rather over wrought solo on a version of Ornette’s `The Blessing` as though he was trying to explore the instrument’s entire compass - but because the session wasn’t issued until 1966 its significance was obscured by the impact of `My Favourite Things`; moreover the album’s title had become something of an anachronism by the time it was issued, the vanguard having moved on. Consequently, it has been regarded as something of a curiosity in the Coltrane catalogue but is worth having for the excellence of Cherry’s contribution even if it doesn’t quite gel overall. Why Coltrane chose to perform a set in the Coleman mode we can only speculate as his own star was high in the firmament by that time, soon to eclipse all contenders to the modernist pantheon.